Our Lady of Fátima (Portuguese: Nossa Senhora de Fátima, formally known as Our Lady of the Holy Rosary of Fátima, European Portuguese: [ˈnɔsɐ sɨˈɲoɾɐ dɨ ˈfatimɐ] Brazilian Portuguese: [ˈnɔsɐ siˈɲɔɾɐ dʒi ˈfatʃimɐ]), is a Catholic title of the Blessed Virgin Mary based on the famed Marian apparitions reported in 1917 by three shepherd children at the Cova da Iria, in Fátima, Portugal. The three children were Lúcia dos Santos and her cousins Francisco and Jacinta Marto. Bishop José Alves Correia da Silva declared the events worthy of belief on 13 October 1930. On 13 May 1946, Pope Pius XII granted a canonical coronation to the venerated image enshrined at the Chapel of the Apparitions of Fátima via his apostolic legate, Cardinal Benedetto Aloisi Masella. On 11 November 1954, he raised the Sanctuary of Fátima to the status of a minor basilica by his papal brief Lucer superna. The published memoirs of Lúcia dos Santos in the 1930s revealed two secrets that she claimed came from the Virgin while the third secret was to be revealed by the Catholic Church in 1960. The controversial events at Fátima gained fame due partly to elements of the secrets, prophecy and eschatological revelations allegedly related to the Second World War and possibly more global wars in the future, particularly the Virgin's alleged request for the Consecration of Russia to the Immaculate Heart of Mary. In the spring and summer of 1916, nine-year-old Lúcia dos Santos and her cousins Francisco and Jacinta Marto were herding sheep at the Cova da Iria near their home village of Aljustrel in the parish of Fátima, Portugal. They later said they were visited three times by an apparition of an angel. They said the angel, who identified himself as the "Angel of Peace" and "Guardian Angel of Portugal", taught them prayers, to make sacrifices, and to spend time in adoration of the Lord. Beginning in the spring of 1917, the children reported apparitions of an Angel, and starting in May 1917, apparitions of the Virgin Mary, whom the children described as "the Lady more brilliant than the Sun". The children reported a prophecy that prayer would lead to an end to the Great War, and that on 13 October that year the Lady would reveal her identity and perform a miracle "so that all may believe." Newspapers reported the prophecies, and many pilgrims began visiting the area. The children's accounts were deeply controversial, drawing intense criticism from both local secular and religious authorities. A provincial administrator briefly took the children into custody, believing the prophecies were politically motivated in opposition to the officially secular First Portuguese Republic established in 1910. The events of 13 October became known as the Miracle of the Sun. Statue dedicated to the apparition of Our Lady which occurred exceptionally in Valinhos, near Cova da Iria. On 13 May 1917, the children reported seeing a woman "brighter than the sun, shedding rays of light clearer and stronger than a crystal goblet filled with the most sparkling water and pierced by the burning rays of the sun." The woman wore a white mantle edged with gold and held a rosary in her hand. She asked them to devote themselves to the Holy Trinity and to pray "the Rosary every day, to bring peace to the world and an end to the war". While the children had never told anyone about seeing the angel, Jacinta told her family about seeing the brightly lit woman. Lúcia had earlier said that the three should keep this experience private. Jacinta's disbelieving mother told neighbors about it as a joke, and within a day the whole village knew of the children's vision. The children said the woman told them to return to the Cova da Iria on 13 June 1917. Lúcia's mother sought counsel from the parish priest, Father Ferreira, who suggested she allow them to go. He asked to have Lúcia brought to him afterward so that he could question her. The second appearance occurred on 13 June, the feast of Saint Anthony, patron of the local parish church. On this occasion the lady revealed that Francisco and Jacinta would be taken to Heaven soon, but Lúcia would live longer in order to spread her message and devotion to the Immaculate Heart of Mary. During the June visit, the children said the lady told them to say the Holy Rosary daily in honor of Our Lady of the Rosary to obtain peace and the end of the Great War. (Three weeks earlier, on 21 April, the first contingent of Portuguese soldiers had embarked for the front lines of the war.) The lady also purportedly revealed to the children a vision of hell, and entrusted a secret to them, described as "good for some and bad for others". Fr. Ferreira later stated that Lúcia recounted that the lady told her, "I want you to come back on the thirteenth and to learn to read in order to understand what I want of you. ...I don't want more." In the following months, thousands of people flocked to Fátima and nearby Aljustrel, drawn by reports of visions and miracles. On 13 August 1917, the provincial administrator Artur Santos (no relation to Lúcia dos Santos) intervened, as he believed that these events were politically disruptive in the conservative country. He took the children into custody, jailing them before they could reach the Cova da Iria. Santos interrogated and threatened the children to get them to divulge the contents of the secrets. Lúcia's mother hoped the officials could persuade the children to end the affair and admit that they had lied. Lúcia told Santos everything short of the secrets, and offered to ask the woman for permission to tell the official the secrets. That month, instead of the usual apparition in the Cova da Iria on 13 August, the children reported that they saw the Virgin Mary on 19 August, a Sunday, at nearby Valinhos. She asked them again to pray the rosary daily, spoke about the miracle coming in October, and asked them "to pray a lot, a lot for the sinners and sacrifice a lot, as many souls perish in hell because nobody is praying or making sacrifices for them." The three children claimed to have seen the Blessed Virgin Mary in a total of six apparitions between 13 May and 13 October 1917. 2017 marked the 100th anniversary of the apparitions. After some newspapers reported that the Virgin Mary had promised a miracle for the last of her apparitions on 13 October, a huge crowd, possibly between 30,000 and 100,000, including reporters and photographers, gathered at Cova da Iria. What happened then became known as the "Miracle of the Sun". Various claims have been made as to what actually happened during the event. The three children who originally claimed to have seen Our Lady of Fátima reported seeing a panorama of visions during the event, including those of Jesus, Our Lady of Sorrows, Our Lady of Mount Carmel, and of Saint Joseph blessing the people. Father John De Marchi, an Italian Catholic priest and researcher wrote several books on the subject, which included descriptions by witnesses who believed they had seen a miracle created by Mary, Mother of God. According to accounts, after a period of rain, the dark clouds broke and the Sun appeared as an opaque, spinning disc in the sky. It was said to be significantly duller than normal, and to cast multicolored lights across the landscape, the people, and the surrounding clouds. The Sun was then reported to have careened towards the earth before zig-zagging back to its normal position. Witnesses reported that their previously wet clothes became "suddenly and completely dry, as well as the wet and muddy ground that had been previously soaked because of the rain that had been falling". Not all witnesses reported seeing the Sun "dance". Some people only saw the radiant colors, and others, including some believers, saw nothing at all. The only known picture of the Sun taken during the event does not show anything unusual. No unusual phenomenon of the Sun was observed by scientists at the time. A number of theologians, scientists, and skeptics have offered alternative explanations that include psychological suggestibility of the witnesses, temporary retinal distortion caused by staring at the intense light of the Sun, and optical effects caused by natural meteorological phenomena. Francisco and Jacinta Marto died in the international flu pandemic that began in 1918 and swept the world. Francisco Marto died at home on 4 April 1919, at the age of ten. Jacinta died at the age of nine in hospital on 20 February 1920. They are buried at the Sanctuary of Fátima. They were beatified by Pope John Paul II on 13 May 2000 and canonized by Pope Francis on 13 May 2017. Their mother Olímpia Marto said that her children predicted their deaths many times to her and to curious pilgrims in the brief period of time after the Marian apparitions. At the age of fourteen, Lúcia was sent to the school of the Sisters of St. Dorothy (Dorothean) in Vilar, a suburb of Porto, Portugal. In 1928 she became a postulant at the convent of the Sisters of St. Dorothy in Tui, Spain, near the border with Portugal. Lúcia continued to report private visions periodically throughout her life. She reported seeing the Virgin Mary again in 1925 in the convent. This time she said she was asked to convey the message of the First Saturdays Devotion. She said that a subsequent vision of Christ as a child reiterated this request. In 1929, Lúcia reported that Mary returned and repeated her request for the Consecration of Russia to her Immaculate Heart. She also reported an apparition in Rianxo, Galicia, in 1931, in which she said that Jesus visited her, taught her two prayers, and delivered a message to give to the church's hierarchy. In 1936 and again in 1941, Sister Lúcia said that the Virgin Mary had predicted the deaths of her two friends during the second apparition on 13 June 1917. According to Lúcia's 1941 account, on 13 June, Lúcia asked the Virgin if the three children would go to heaven when they died. She said that she heard Mary reply, "Yes, I shall take Francisco and Jacinta soon, but you will remain a little longer, since Jesus wishes you to make me known and loved on Earth. He wishes also for you to establish devotion in the world to my Immaculate Heart." In 1947, Sister Lúcia left the Dorothean order. She joined the Discalced Carmelite Order in a monastery in Coimbra, Portugal. Lúcia died on 13 February 2005, at the age of 97. Basilica of Our Lady of the Rosary. The panoramic view of Cova da Iria. The image of Our Lady of Fátima in the Chapel of the Apparitions. The widely reported miracle of the Sun contributed to Fátima quickly becoming a major centre of pilgrimage. Two million pilgrims visited the site in the decade following the events of 1917. A small chapel – the Capelinha – was built by local people on the site of the apparitions. The construction was neither encouraged nor hindered by the Catholic Church authorities. On 13 May 1920, pilgrims defied government troops to install a statue of the Virgin Mary in the chapel. The Holy Sacrifice of the Mass was first officially celebrated there in January 1924. A hostel for the sick was begun in that year. In 1927 the first rector of the sanctuary was appointed, and a set of Stations of the Cross were erected on the mountain road. The foundation stone for the present basilica was laid the next year. In 1930 the Catholic Church officially recognised the apparition events as "worthy of belief" and granted a papal indulgence to pilgrims visiting Fátima. In 1935 the bodies of the child visionaries, Francisco and Jacinta, were reinterred in the basilica. Pope Pius XII granted a Canonical Coronation of the statue of Our Lady of Fátima on 13 May 1946. This event drew such large crowds that the entrance to the site had to be barred. In the 21st century, pilgrimage to the site takes place year round. Additional chapels, hospitals and other facilities have been constructed at the site. The principal pilgrimage festivals take place on the thirteenth day of each month, from May to October, on the anniversaries of the original apparitions. The largest crowds gather on 13 May and 13 October, when up to a million pilgrims have attended to pray and witness processions of the statue of Our Lady of Fátima, both during the day and by the light of tens of thousands of candles at night. The reported visions at Fátima gathered widespread attention, as numerous pilgrims began to visit the site. After a canonical inquiry, the Bishop of Leiria-Fátima officially declared the visions of Fátima as "worthy of belief" in October 1930, officially permitting the belief of Our Lady of Fátima. At the time of the apparitions, Portugal was undergoing tensions between the secularizing Republican government and more conservative elements in society. The First Republic had begun with the revolution of 1910 overthrowing the constitutional monarch. It was intensely anticlerical and provoked a strong conservative reaction, ultimately leading to the military coup of 1926. Later in Spain during the 1920s and 1930s, as the forces of the Republic gathered strength, armies of the faithful carried the Virgin Mary against groups they said were godless. During the Spanish Second Republic, apparitions of the Virgin Mary were seen on Spanish soil at Ezquioga. Ramona Olazabal said that Mary had marked the palms of her hands with a sword. Seers gained much credence in Integrist and Carlist circles. The visions at Ezquioga were widely covered in the press, as were sixteen other visitations of the Virgin reported in 1931 in Spain. Conservative elements in the Spanish Church actively encouraged the Fátima devotion as a way of countering the perceived threat of atheistic Communism. In Portugal and its former colony of Brazil, conservative groups were sometimes associated with the cult of Fátima. When Germany invaded Russia in 1941, some Catholics interpreted this in terms of the Fátima apparitions, and believed that the Virgin's prophecy was about to be fulfilled. The original apparitions took place during the six months preceding the Bolshevik revolution in Russia, and supposedly the Lady talked to the children about the need to pray for Russia. Lucia admitted later that the children initially thought she was requesting prayers for a girl named Russia. In the first edition of Sister Lúcia's memoirs, published after the outbreak of WW II, she focused on the issue of Russia. The warning by the Lady that "if Russia was not consecrated, it would spread its errors throughout the world" was often seized upon as an anti-communist rallying cry. The Blue Army of Our Lady of Fátima, for instance, has always been strongly anti-Communist and its members often associated the Fátima story in the context of the Cold War. The Blue Army is made up of Catholics who believe that by dedicating themselves to daily prayer (specifically, of the Rosary), they can help to achieve world peace and put an end to the error of communism. Organizations such as the Blue Army have gained the approval of the Catholic Church. Statue depicting the Immaculate Heart of Mary as described by Sister Lúcia, the famous visionary of Fátima. A statue of the Immaculate Heart of Mary holding a rosary in accordance to the alleged Marian apparition. The Fátima story developed in two parts: that which was reported in 1917, and information later mentioned in Sister Lúcia's memoirs which she wrote years later, after the Church ruled that the events in Fátima were "worthy of belief." Her memoir was not subject to the same scrutiny. The early messages focused on the need to pray the rosary for peace and an end to World War I. The supernatural events in Fátima were not widely known outside Portugal and Spain until Lúcia published her memoirs, starting in the late 1930s. Between 1935 and 1993, she wrote six memoirs. The first four, written between 1935 and 1941 during World War II, are now published under the title Fatima in Lucia's Own Words. The fifth and six memoirs, written in 1989 and 1993, are published as Fatima in Lucia's Own Words II. In the mid-1930s the Bishop of Leiria encouraged Lúcia (at that time named Sister Maria Lúcia das Dores) to write her memoirs, so that she might reveal further details of the 1917 apparitions. In her first memoir, published in 1935, focused on the holiness of Jacinta Marto. The deceased girl was by then popularly considered a saint. In her second memoir, published in 1937, Lucia wrote more about her own life, the apparition of 13 June 1917, and first reveals the earlier apparitions of the Angel of Peace. In her third memoir of 1941, Sister Lúcia described three secrets. She said these had been entrusted to the children during the apparition of 13 July 1917. This was a vision of hell, which Lúcia said they experienced on 13 July 1917. This was a recommendation for devotion to the Immaculate Heart of Mary as a way to save souls and bring peace to the world. It predicted an end to the Great War, but predicted a worse one if people did not cease offending God. This second war would be presaged by a night illuminated by an unknown light, as a "great sign" that the time of chastisement was near. To avert this, Mary would return to ask for the consecration of Russia to the Immaculate Heart, and the establishment of the First Saturdays Devotion. If her requests were heeded, Russia would be converted, and there would be peace; if not, Russia would spread her errors throughout the world, causing wars and persecutions of the Church. It ended with a promise that in the end, "the Immaculate Heart would triumph. The Holy Father would consecrate Russia to Mary, and a period of peace would be granted to the world." On 25 January 1938 (during solar cycle 17), bright lights, an aurora borealis appeared over the northern hemisphere, including in places as far south as North Africa, Bermuda and California. It was the widest occurrence of the aurora since 1709 and people in Paris and elsewhere believed a great fire was burning and notified fire departments. Sister Lúcia indicated that it was the sign foretold and so apprised her superior and the bishop in letters the following day. Just over a month later, Hitler seized Austria and eight months later invaded Czechoslovakia. Statue of Pope Pius XII in Fátima, Portugal. "Just as a few years ago We consecrated the entire human race to the Immaculate Heart of the Virgin Mary, Mother of God, so today We consecrate and in a most special manner We entrust all the peoples of Russia to this Immaculate Heart..."
According to Sister Lúcia, the Virgin Mary promised that the Consecration of Russia would lead to Russia's conversion and an era of peace. At the time the supposed request for the consecration of Russia was made, however, the Bolsheviks had not yet taken control of Russia. In 1952 the Pope said to the Russian people and the Stalinist regime that the Virgin Mary was always victorious. "The gates of hell will never prevail, where she offers her protection. She is the good mother, the mother of all, and it has never been heard, that those who seek her protection, will not receive it. With this certainty, the Pope dedicates all people of Russia to the immaculate heart of the Virgin. She will help! Error and atheism will be overcome with her assistance and divine grace." Popes Pius XII and John Paul II both had a special relationship with Our Lady of Fátima. Pope Benedict XV began Pacelli's church career, elevating him to archbishop in the Sistine Chapel on 13 May 1917, the date of the first reported apparition. Pius XII was laid to rest in the crypt of Saint Peter's Basilica on 13 October 1958, the Feast of Our Lady of Fátima. Pope John Paul II again consecrated the entire world to the Virgin Mary in 1984, without explicitly mentioning Russia. Some believe that Sister Lúcia verified that this ceremony fulfilled the requests of the Virgin Mary. However, in the Blue Army's Spanish magazine, Sol de Fátima, in the September 1985 issue, Sister Lúcia said that the ceremony did not fulfill the Virgin Mary's request, as there was no specific mention of Russia and "many bishops attached no importance to it." In 2001, Archbishop Tarcisio Bertone met with Sister Lúcia, who reportedly told him, "I have already said that the consecration desired by Our Lady was made in 1984, and has been accepted in Heaven." Sister Lúcia died on 13 February 2005, without making any public statement of her own to settle the issue. Some maintain that, according to Lúcia and Fátima advocates such as Abbé Georges de Nantes, Fr. Paul Kramer and Nicholas Gruner, Russia has never been specifically consecrated to the Immaculate Heart of Mary by any Pope simultaneously with all the world's bishops, which is what Lúcia in the 1985 interview had said Mary had asked for. I come to answer your question, "If the consecration made by Pope John Paul II on 25 March 1984 in union with all the bishops of the world, accomplished the conditions for the consecration of Russia according to the request of Our Lady in Tui, Spain on 13 June 1929?" Yes, it was accomplished, and since then I have said that it was made. And I say that no other person responds for me, it is I who receive and open all letters and respond to them. In the meantime, the conception of Theotokos Derzhavnaya, Orthodox Christian venerated icon, points out that Virgin Mary is considered actual Tsarina of Russia by the religious appeal of Nicholas II; thus "Consecration of Russia" may refer to return of Russian monarchy. The icon was brought to Fátima in 2003 and 2014, together with another significant icon, the Theotokos of Port Arthur. Statue of Our Lady of Fátima in the Church of Santa María Madalena, Madalena, the Azores, 2007. The devotion is especially popular among Catholics in Lusophone countries and the Portuguese diaspora. "After the two parts which I have already explained, at the left of Our Lady and a little above, we saw an Angel with a flaming sword in his left hand; flashing, it gave out flames that looked as though they would set the world on fire; but they died out in contact with the splendour that Our Lady radiated towards him from her right hand: pointing to the earth with his right hand, the Angel cried out in a loud voice: 'Penance, Penance, Penance!' And we saw in an immense light that is God: 'something similar to how people appear in a mirror when they pass in front of it' a Bishop dressed in White 'we had the impression that it was the Holy Father'. Other Bishops, Priests, Religious men and women going up a steep mountain, at the top of which there was a big Cross of rough-hewn trunks as of a cork-tree with the bark; before reaching there the Holy Father passed through a big city half in ruins and half trembling with halting step, afflicted with pain and sorrow, he prayed for the souls of the corpses he met on his way; having reached the top of the mountain, on his knees at the foot of the big Cross he was killed by a group of soldiers who fired bullets and arrows at him, and in the same way there died one after another the other Bishops, Priests, Religious men and women, and various lay people of different ranks and positions. Beneath the two arms of the Cross there were two Angels each with a crystal aspersorium in his hand, in which they gathered up the blood of the Martyrs and with it sprinkled the souls that were making their way to God." Lúcia declared that the Third Secret could be released to the public after 1960. Some sources, including Canon Barthas and Cardinal Ottaviani, said that Lúcia insisted to them it must be released by 1960, saying that, "by that time, it will be more clearly understood", and, "because the Blessed Virgin wishes it so." Instead, in 1960 the Vatican published an official press release stating that it was "most probable the Secret would remain, forever, under absolute seal." This announcement triggered widespread speculation. According to the New York Times, speculation over the content of the secret ranged from "worldwide nuclear annihilation to deep rifts in the Roman Catholic Church that lead to rival papacies." The Vatican did not publish the Third Secret, a four-page, handwritten text, until 26 June 2000. Such writers as Father Paul Kramer, Christopher Ferrara, Antonio Socci, and Marco Tosatti have suggested that this was not the full text of the secret and stating the Third Secret is not the full text. They alleged that Cardinals Bertone, Ratzinger and Sodano concealed the existence of another one-page document, containing information about the Apocalypse and a great apostasy. The Vatican has maintained its position that the full text of the Third Secret was published. According to a December 2001 Vatican press release (published in L'Osservatore Romano), Lúcia told then-Archbishop Bertone in an interview that the secret had been completely revealed when published. During his apostolic visit to Portugal during 11–14 May 2010 on the 10th anniversary of the beatification of Jacinta and Francisco Marto, Pope Benedict XVI explained to reporters that the interpretation of the third secret did not only refer to the attempted assassination of Pope John Paul II in Saint Peter's Square in 1981. He said that the third secret, "has a permanent and ongoing significance," and that, "its significance could even be extended to include the suffering the Church is going through today as a result of the recent reports of sexual abuse involving the clergy." Many Roman Catholics recite prayers based on Our Lady of Fátima. Lúcia later said that, in 1916, she and her cousins had several visions of an angel calling himself the "Angel of Portugal" and the "Angel of Peace," who taught them to bow with their heads to the ground and to say "My God, I believe, I adore, I hope, and I love you. I ask pardon for those who do not believe, do not adore, do not hope and do not love you." Lúcia later set this prayer to music and a recording exists of her singing it. It was also said that sometime later, the angel returned and taught them a eucharistic devotion now known as the Angel Prayer. Lúcia said that the Lady emphasized Acts of Reparation and prayers to console Jesus for the sins of the world. Lúcia said that Mary's words were, "When you make some sacrifice, say 'O Jesus, it is for your love, for the conversion of sinners, and in reparation for sins committed against the Immaculate Heart of Mary.'" At the apparition of 13 July 1917, Lucia said Mary told the children that sinners could be saved from damnation by devotion to the Immaculate Heart, but also by making "sacrifices". They heard her repeat the idea of sacrifices several times. Her vision of hell prompted them to ever more stringent self-mortifications to save souls. Among many other practices, Lúcia wrote that she and her cousins wore tight cords around their waists, flogged themselves with stinging nettles, gave their lunches to beggars, and abstained from drinking water on hot days. Francisco and Jacinta became extremely devoted to this practice. Lúcia wrote that Mary said God was pleased with their sacrifices and bodily penances. At the first apparition, Lúcia wrote, the children were so moved by the radiance that they involuntarily said "Most Holy Trinity, I adore you! My God, my God, I love you in the Most Blessed Sacrament." Lúcia also said that she heard Mary ask for the following words to be added to the Rosary after the Gloria Patri prayer: "O my Jesus, pardon us, save us from the fires of hell. Lead all souls to heaven, especially those in most need." According to Vatican teaching on the tradition of Marian visitations, references to the "conversion of sinners" do not necessarily mean religious conversion to the Roman Catholic Church. Pope Leo XIII, in his encyclical on the "Unity of the Church, Satis Cognitum", said that would mean the "conversion of heretics or apostates who are 'outside the church and alien to the Christian Faith.' Rather, "conversion of sinners" refers to general repentance and an attempt to amend one's life according to the teachings of Jesus for those true Catholics who are fallen into sins. Lúcia wrote that she and her cousins defined "sinners" not as non-Catholics but as those who had fallen away from the church or, more specifically, willfully indulged in sinful activity, particularly "sins of the flesh" and "acts of injustice and a lack of charity towards the poor, widows and orphans, the ignorant and the helpless," which she said were even worse than sins of impurity. The cultus of the Immaculate Heart is the central message of Fátima. Ecclesiastical approbation does not imply that the Church provides an infallible guarantee on the supernatural nature of the event. But, Karl Rahner and other theologians have said that popes, by authoritatively fostering the Marian veneration in places such as Fátima and Lourdes, motivate the faithful into an acceptance of divine faith. In October 1930 Bishop da Silva declared that the apparitions at Fátima were "worthy of belief," and approved public devotion to the Blessed Virgin under the title Our Lady of Fátima. The Vatican granted indulgences and permitted special Liturgies of the Mass to be celebrated in Fátima. In 1939, Eugenio Pacelli, who was consecrated as a bishop on 13 May 1917 — the day of the first apparition — was elected to the papacy as Pius XII. He is considered to have become "the Pope of Fátima." In 1940 after World War II had started, Sister Lúcia asked Pope Pius XII to consecrate the world and Russia to the Immaculate Heart of Mary. She repeated this request later that year on 2 December 1940, stating that in the year 1929, the Blessed Lady requested in another apparition that Russia be consecrated to her Immaculate Heart. Mary was said to promise the conversion of Russia from its errors. On 13 May 1942, the 25th anniversary of the first apparition and the silver jubilee of the episcopal consecration of Pope Pius XII, the Vatican published the "Message and Secret of Fátima." On 31 October 1942, Pope Pius XII, in a radio address to the people of Portugal, discussed the apparitions of Fátima and consecrated the human race to the Immaculate Heart of the Virgin, with specific mention of Russia. (See below) On 8 December 1942, the Pontiff officially and solemnly declared this consecration in a ceremony in Saint Peter's Basilica in Rome. "The faithful virgin never disappointed the trust put on her. She will transform into a fountain of graces, physical and spiritual graces, over all of Portugal, and from there, breaking all frontiers, over the whole Church and the entire world". On 1 May 1948, in Auspicia quaedam, Pope Pius XII requested the consecration to the Immaculate Heart of every Catholic family, parish and diocese. "It is our wish, consequently, that wherever the opportunity suggests itself, this consecration be made in the various dioceses as well as in each of the parishes and families." On 18 May 1950, the Pope again sent a message to the people of Portugal regarding Fátima: "May Portugal never forget the heavenly message of Fátima, which, before anybody else she was blessed to hear. To keep Fátima in your heart and to translate Fátima into deeds, is the best guarantee for ever more graces". In numerous additional messages, and in his encyclicals Fulgens corona (1953), and Ad Caeli Reginam (1954), Pius XII encouraged the veneration of the Virgin in Fátima. At the end of the Second Vatican Council, Pope Paul VI renewed the consecration of Pius XII to the Immaculate Heart of Mary. In an unusual gesture, he announced his own pilgrimage to the sanctuary on the fiftieth anniversary of the first apparition. On 13 May 1967, he prayed at the shrine together with Sister Lúcia. In the final and historic consecration of Russia to the Immaculate Heart of Mary, Pope John Paul II on 25 March 1984 consecrated Russia and the world in a public ceremony at St. Peter's in Rome; the consecration was in the form of a 'whole-world consecration' carried out in union with the Catholic bishops throughout the world. Cardinal Bertone said to the press many times that the message of Fátima was finished. Pope John Paul II credited Our Lady of Fátima with saving his life following an assassination attempt on 13 May 1981, the Feast of Our Lady of Fátima. Then on 12 May 1987, he expressed his gratitude to the Virgin Mary for saving his life. The following day, he renewed the consecration of Pius XII to the Immaculate Heart of the Virgin. On 12–13 May 2010, Pope Benedict XVI visited the Sanctuary of Our Lady of Fátima and strongly stated his acceptance of the supernatural origin of the Fátima apparitions. On the first day, the Pope arrived at the Chapel of Apparitions to pray; he gave a Golden Rose to Our Lady of Fátima "as a homage of gratitude from the Pope for the marvels that the Almighty has worked through you in the hearts of so many who come as pilgrims to this your maternal home". The Pope also recalled the "invisible hand" that saved John Paul II. He said in a prayer to the Blessed Virgin Mary that "it is a profound consolation to know that you are crowned not only with the silver and gold of our joys and hopes, but also with the 'bullet' of our anxieties and sufferings." On the second day, Pope Benedict spoke to more than 500,000 pilgrims; he referred to the Fátima prophecy about the triumph of the Immaculate Heart of Mary and related it to the final "glory of the Most Holy Trinity." Pius XII, Paul VI, John Paul II, Benedict XVI and Pope Francis all voiced their acceptance of the supernatural origin of the Fátima events. In March 2017 the Holy See announced that Pope Francis would canonize two of the visionaries, Francisco and Jacinta Marto, on 13 May at a Mass in Fátima during a two-day visit. The decision followed papal confirmation of a miracle attributed to the intercession of the two visionaries. The pope solemnly canonized the children on 13 May 2017 during the centennial of the first apparition. The International Pilgrim image of Our Lady of Fátima has traveled the world since the 1950s. The Immaculate Heart of Mary, installed above the main facade of the shrine at Fátima. Sister Lúcia dos Santos said this most closely resembled her Marian apparitions of 1917. The famed statue carved by Jose Thedim, now enshrined within the Chapel of Apparitions, was canonically crowned on 13 May 1946 by Pope Pius XII. It was venerated by Pope John Paul II in 1982 who added the bullet from his attempted assassination to the same crown. The International Pilgrim of Fátima, informally known as the Pilgrim Statue, has been taken around the world to Catholic audiences after being blessed on 13 October 1947 by the local bishop of Leiria, Portugal. The so-called U.N. Virgin Fátima statue, which once stood in the oratory chapel of the Headquarters of the United Nations in New York City, United States. It was blessed by the Bishop of Leiria on 13 October 1952. Our Lady of Fátima is carried in procession as part of the festival of Quyllur Rit'i, held in the highlands of the mountains Sinaqara and Qullqipunku in Cusco Region, Peru. The festival attracts 10,000 pilgrims annually. Since 1984, a statue of Our Lady of Fatima, also known as the International Pilgrim Statue, has been enshrined in the Immaculate Heart of Mary Shrine at the Congregation of the Mother of the Redeemer's monastery in Carthage, Missouri, United States. The statue is removed once a year during the Marian Days celebration for a procession around Carthage. The National Pilgrim Image of Our Lady of Fatima - Philippines, also known as the EDSA Image, is a gift to the Philippines from the Sanctuary of Fatima in Portugal. It was blessed by Pope Saint Paul VI in 1967 during the 50th Anniversary of the Apparitions. It was crowned as the National Pilgrim Image in 1984 by the late Jaime Cardinal Sin and became the main Fatima image during the peaceful EDSA People Power Revolution of 1986. The image has been taken around the country in different Churches and Schools. The image was Episcopally Crowned by the late Bishop Jose Oliveros of Malolos in celebration of the Centennial of the Apparitions, with the crown and rosary as gifts from the Sanctuary of Fatima. ^ "Results of the Investigative Commission". October 1930. Retrieved 3 June 2017. ^ a b c "OUR LADY OF FATIMA :: Catholic News Agency (CNA)". Retrieved 8 September 2016. ^ a b c d Bennett, Jeffrey S. (2012). When the Sun Danced: Myth, Miracles, and Modernity in Early Twentieth-Century Portugal. University of Virginia Press. ISBN 978-0813932507. ^ Jaki, Stanley. God and the Sun at Fátima (1999) Real View Books, Michigan, p. 15. ^ Petruzzello, Melissa. "100th Anniversary of Our Lady of Fátima". Encyclopædia Britannica. Retrieved 16 May 2017. ^ De Marchi, John (1952). The True Story of Fátima. St. Paul, Minnesota: Catechetical Guild Entertainment Society. ^ Jaki, Stanley L. (1999). God and the Sun at Fátima. Real View Books. pp. 170–71, 232, 272. ASIN B0006R7UJ6. ^ Sainte Trinite, Frere Michel de la (1989). "Chapter X, appendix II". The Whole Truth About Fátima, Volume I: Science and the Facts. Names Izabel Brandao de Melo, and a few vague or unverifiable accounts. ^ Haffert, John (1961). "Meet the Witnesses" (PDF). ^ "Shrine of Our Lady of Fatima – Fatima, Portugal". Sacred Destinations. Retrieved 8 September 2016. ^ Dunning, Brian. "Skeptoid #110: Illuminating the Fatima Miracle of the Sun". Skeptoid. Retrieved 16 April 2017. ^ Radford, Benjamin (2 May 2013). "The Lady of Fátima & the Miracle of the Sun". LiveScience.com. Archived from the original on 17 October 2013. ^ DeMarchi, John. True Story of Fátima, 1952. ^ a b LaBoda, Sharon (1 January 1996). Ring, Trudy; Salkin; La Boda, Sharon (eds.). International Dictionary of Historic Places: Southern Europe. Taylor & Francis. p. 245. ISBN 978-1884964022. ^ "In virtue of considerations made known, and others which for reason of brevity we omit; humbly invoking the Divine Spirit and placing ourselves under the protection of the most Holy Virgin, and after hearing the opinions of our Rev. Advisors in this diocese, we hereby: 1) Declare worthy of belief, the visions of the shepherd children in the Cova da Iria, parish of Fátima, in this diocese, from 13 May to 13 October 1917. 2) Permit officially the belief of Our Lady of Fátima. ", Bishop of Leiria-Fátima, 13 October 1930. ^ Vincent, Mary (25 July 1996). Catholicism in the Second Spanish Republic: Religion and Politics in Salamanca, 1930–1936. Oxford historical monographs. New York City: Clarendon Press. pp. 82–108. ISBN 978-0198206132. ^ Kselman, Thomas A.; Avella, Steven (July 1986). "Marian Piety and the Cold War in the United States". The Catholic Historical Review. 72 (3): 402–424. JSTOR 25022337. ^ a b c Maunder, Chris (25 April 2016). Our Lady of the Nations: Apparitions of Mary in 20th-century Catholic Europe. Oxford University Press. ISBN 978-0198718383. ^ a b c Petrisko, Thomas W.; Laurentin, Rene & Fontecchio, Michael J. (1998). The Fátima Prophecies: At the Doorstep of the World. St. Andrews Productions. p. 48. ^ "Aurora borealis glows in widest area since 1709". Chicago Daily Tribune. 26 January 1938. p. 4. Retrieved 28 August 2017. ^ Consecration of Russia FAQ at catholicdoors.com, with quotations from Lúcia and pointing out possible signs that the 1984 consecration was sufficient. Page found 19 May 2010. ^ Bertone, Tarciso (2001). "Meeting with Sr Maria Lucia" (web page). Irondale, Alabama: Eternal Word Television Network. Retrieved 29 July 2016. ^ Apocalyptic Times at Catholic Counter-Reformation, Abbe Georges de Nantes' website. Page found 19 May 2010. ^ Kramer, Father Paul. The Devil's Final Battle (1st Edition). (Content available for free online). ^ Sister Lucy States: "Russia Is Not Yet Properly Consecrated" at Fr. Nicholas Gruner's website, fatima.org. Page found 19 May 2010. ^ (in Russian) Orthodox Shrines Visit Fátima (in Russian: English translation here). ^ Kramer, Father Paul. The Devil's Final Battle (1st Edition). pp. 29–30. (Content available for free online). ^ Frere Michel de la Sainte Trinite (1990). The Whole Truth About Fátima, Volume III. Buffalo, New York, U.S.A. p. 470. ^ Frere Michel de la Sainte Trinite (1990). The Whole Truth About Fátima, Volume III. Buffalo, New York. pp. 578–79. ^ Stanley, Alessandra (14 May 2000). "Vatican Discloses the 'Third Secret' of Fatima". The New York Times. Retrieved 28 August 2017. ^ a b "The Message of Fátima". Congregation of the Doctrine of the Faith. Retrieved 30 October 2009. ^ a b Kramer, Father Paul (2002). The Devil's Final Battle (1st Edition). Good Counsel Publications Inc. ISBN 978-0-9663046-5-7. (Content available for free online --click book title). ^ a b Ferrara, Christopher (2008). The Secret Still Hidden. Good Counsel Publications Inc. ISBN 978-0-9815357-0-8. ^ a b Socci, Antonio (2006). Il Quarto Segreto di Fátima ("The Fourth Secret of Fátima" – (in Italian). Italy. ^ Tosatti, Marco (2002). Il Segreto Non Svelato ("The Unrevealed Secret" – Italian only). ISBN 978-88-384-4552-1. ^ "In Contro di S.E. Mons. Tarcisio Bertone con Suor Maria Lúcia de Jesus e do Coração Imaculado" [Meeting of S.E. Mons. Tarcisio Bertone with Sister Maria Lúcia de Jesus of the Immaculate Heart] (Press release) (in Italian). Holy See Press Office. 20 December 2001. Retrieved 28 August 2017. ^ "Meeting with Sr. Maria Lúcia". (English translation of 20-12-01 Vatican Press Release). ETWN: Global Catholic Network. 9 January 2002. Retrieved 30 March 2010. ^ "No More Mysteries in Fátima Secret, Sister Lúcia Says". Innovative Media, Inc. Zenit News Agency. 20 December 2001. Retrieved 30 March 2010. ^ "Apostolic Journey to Portugal on the occasion of the 10th Anniversary of the Beatification of Jacinta and Francisco, young shepherds of Fátima (11–14 May 2010)". Vatican Press Office. 11 May 2010. ^ "The Pope and the 'Third Secret'". ABC News. 14 May 2010. Retrieved 8 September 2016. ^ Rodriguez, Father Michael (Autumn 2016). 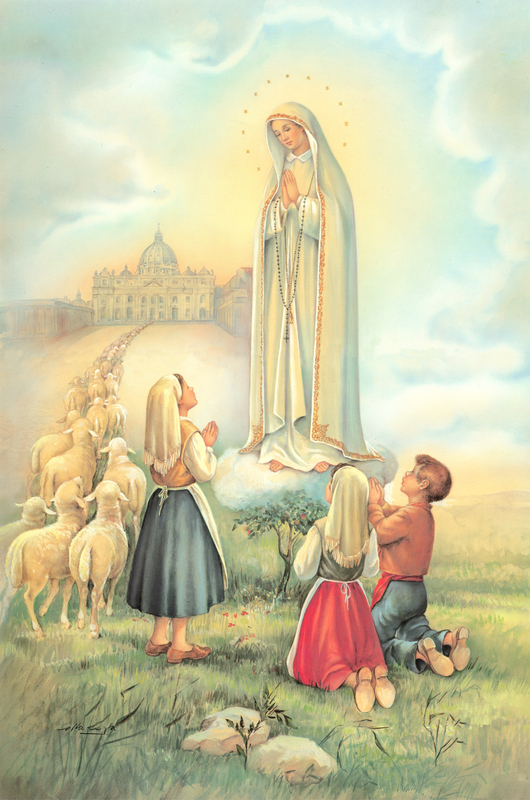 "The Angel of Fatima and Reparation at Holy Mass" (PDF). The Fatijma Crusader (116). ^ "Fatima and the Scapular". Salve Maria Regina. 40 (104). 2000. ^ The Congregation for the Causes of Saints, in the report that confirmed Jacinta as beatified, observed that she seemed to have "an insatiable hunger for immolation." Congregation for the Causes of Saints Decree regarding the Canonization of the Servant of God Jacinta Marto. 13 May 1989. ^ Lúcia Santos, Fátima in Lucia's Own Words, Full text online at piercedhearts.org, translation by the Dominican Nuns of the Perpetual Rosary, p. 93. ^ William Thomas Walsh, Our Lady of Fátima, p. 52. ^ From an undated letter written by Lúcia and quoted in Fátima, caminho da paz (Fátima, the Path to Peace) by A. M. Martins (Braga, 1983), pp. 88–89. Reprinted in "The Whole Truth of Fátima, Part 4" Archived 27 June 2010 at the Wayback Machine, Catholic Voice webpage; retrieved 30 April 2010. ^ Mark Miravalle, 1993, Introduction to Mary, p. 171. ^ "13 May 2010: Apostolic Journey to Portugal on the occasion of the 10th Anniversary of the Beatification of Jacinta and Francisco, young shepherds of Fátima – Holy Mass on the Esplanade of the Shrine of Our Lady of Fátima – BENEDICT XVI". Retrieved 8 September 2016. ^ Fugere, Cori Urban (30 August 2013). "Marian Days in Carthage". The Mirror. Roman Catholic Diocese of Springfield–Cape Girardeau. Retrieved 7 August 2017. ^ "Vietnamese Catholics in the US". Religion & Ethics Newsweekly. WNET. 21 September 2012. Retrieved 7 August 2017. ^ "Hướng về 30 năm Thánh Tượng Mẹ Fatima ở với đoàn con Đồng Công tại Đền thánh Khiết Tâm Mẹ, Carthage, Missouri" [The 30-year journey of the Our Lady of Fatima Statue to the Coredemptrix congregation in the Immaculate Heart of Mary Shrine, Carthage, Missouri] (in Vietnamese). 8 March 2017. Retrieved 7 August 2017. Alonso, Joaquín María (1976). La verdad sobre el secreto de Fátima: Fátima sin mitos (in Spanish). Centro Mariano "Cor Mariae Centrum". ISBN 978-84-85167-02-9. Retrieved 26 October 2010. Alonso, Joaquin Maria; Kondor, Luis (1998). Fátima in Lúcia's own words: sister Lúcia's memoirs. Secretariado dos Pastorinhos. ISBN 978-972-8524-00-5. Retrieved 26 October 2010. Cuneo, Michael. The Vengeful Virgin: Studies in Contemporary Catholic Apocalypticism. in Robbins, Thomas; Palmer, Susan J. (1997). Millennium, messiahs, and mayhem: contemporary apocalyptic movements. Psychology Press. ISBN 978-0-415-91649-3. Retrieved 26 October 2010. Bennett, Jeffrey S. (2012). When the Sun Danced: Myth, Miracles, and Modernity in Early Twentieth Century. University of Virginia Press. ISBN 978-0-8139-3250-7. De Marchi, John (1952). "The Immaculate Heart". New York: Farrar, Straus and Young. Ferrara, Christopher (2008). The Secret Still Hidden. Good Counsel Publications Inc. ISBN 978-0-9815357-0-8. Frère François de Marie des Anges (1994). "Fátima: Tragedy and Triumph". New York, U.S.A.
Frere Michel de la Sainte Trinite (1990). "The Whole Truth About Fátima, Volume III". New York, U.S.A.
Kramer, Father Paul (2002). The Devil's Final Battle. Good Counsel Publications Inc. ISBN 978-0-9663046-5-7. Haffert, John M. (1993). Her Own Words to the Nuclear Age: The Memoirs of Sr. Lúcia, with Comments by John M. Haffert. The 101 Foundation, Inc. ISBN 1-890137-19-7. "Official Vatican Statement releasing the Message of Fátima". "United Nations' pilgrim statue of Our Lady of Fátima". "High Resolution image of Our Lady of Fátima". "Our Lady of Fátima International Tour for Peace". America Needs Fatima is a campaign of the American Society for the Defense of Tradition, Family and Property (TFP), a Catholic 501(c)(3) non-profit organization. Its stated goal is to "win the heart and soul of America for Mary by spreading Our Lady of Fátima message and promoting devotion to her Immaculate Heart." Artur de Oliveira Santos (22 January 1884 – 27 June 1955), was a Portuguese journalist and local politician, mayor of Ourém, in which the locality of Fátima was located, during the time of the apparitions of Our Lady of Fátima to three young shepherd children in 1917. Cova da Iria is a quarter in the city and civil parish of Fátima, in the municipality of Ourém, Santarém District, province of Beira Litoral, in the Central Region and Middle Tagus Subregion of Portugal. It was where occurred the apparitions of Our Lady of Fátima to the three little shepherds in 1917. This world-famous neighborhood is considered the wealthy area of the city of Fátima where, currently, there are numerous convents, hotels and luxury condominiums. It is located near the places of Aljustrel and Valinhos. The Fátima Movement of Priests is a Roman Catholic movement organized by priests who follow the Marian devotion to Our Lady of Fátima, and was founded under the auspices of the Fatima Center. Fatima in Lucia's Own Words (Portuguese: Memórias da Irmã Lúcia, also known as Sister Lucia's Memoirs) is a collection of memoirs and letters written by Sister Lúcia of Fátima (O.C.D. ), the last surviving seer of Virgin Mary apparitions in Cova da Iria, Fátima, Portugal. This book (the first of two volumes) describes the life of Sister Lúcia, as well as the characters, lives and deaths of the other two children – Francisco and Jacinta Marto. It includes the visions of the three little shepherds of Fátima, which included Hell, War, the Holy Father, the Three Secrets and the Angel of Peace and Marian apparitions themselves. Photos include the uncorrupted body of Saint Jacinta Marto. Edited by Louis Kondor, this book was originally introduced by Joaquin M. Alonso, and was translated into English by the Dominican Nuns of the Perpetual Rosary and published by the Portuguese Postulation for the Three Little Shepherds of Fátima (Secretariado dos Pastorinhos). Fatima in Lucia's Own Words II (also known as Sister Lucia's Memoirs II) is a book written by Sister Lúcia of Fátima (O.C.D.) and contains the 5th and 6th memoirs of the last surviving seer of Virgin Mary apparitions in Cova da Iria, Fátima, Portugal. This book is the second of two volumes: the Fifth Memoir is about her father, while the Sixth Memoir is about her mother. The book also contains several pictures of her family home, including interior rooms, and pictures of brothers, sisters and parents, and drawings showing the layout of Lúcia's home, and the general layout of the property. Edited by Father Louis Kondor, S.V.D., this book was translated into English language by the Dominican Nuns of the Perpetual Rosary and published by the Portuguese Postulation for the Three Little Shepherds of Fátima (Secretariado dos Pastorinhos). The First Saturdays Devotion (also called the Act of Reparation to the Immaculate Heart of the Blessed Virgin Mary) is a Catholic devotion which, according to Sister Lúcia of Fátima, was requested by the Virgin Mary in an apparition at Pontevedra, Spain, in December 1925. This devotion has been approved by the Roman Catholic Church. Fátima (Portuguese pronunciation: [ˈfatimɐ] (listen)) is a city in the municipality of Ourém, Beira Litoral Province, in the Central Region and Middle Tagus Subregion of Portugal, with 71.29 km² of area and 11 788 inhabitants (2011). Its population density is 162,7 hab/km². The homonymous civil parish encompasses several villages and localities of which the city of Fátima, with a population of 7,756 residents, is the largest. The Guardian Angel of Portugal (Portuguese: Anjo da Guarda de Portugal) is also referred to as the Angel of Portugal (Anjo de Portugal), the Holy Guardian Angel of Portugal (Santo Anjo da Guarda de Portugal), the Custodian Angel (Anjo Custódio) or the Angel of Peace (Anjo da Paz). All of this designations are attributed to Saint Michael the Archangel representing "Portugal", that is, the spiritual essence in the figure of an archangel who protects the Portuguese nation. Our Lady's Rosary Makers is a non-profit Catholic apostolate in Louisville, Kentucky, USA dedicated to spreading devotion to the Virgin Mary and the Rosary. According to the OLRM Web site, its 17,000 members, in the U.S. and other countries, make and distribute roughly seven million cord and chain rosaries annually for missions around the world, and have distributed hundreds of millions of rosaries to Catholic missions worldwide. Our Lady of Fatima University (formerly known as Our Lady of Fatima and Fatima Medical Science Foundation, Inc.) is a private university in the Philippines. It has five main campuses, one based in Valenzuela City, the others in Quezon City, Antipolo, Rizal, Pampanga, and the newly constructed Nueva Ecija Doctors Colleges Inc. The university concentrates mainly on allied medical sciences. Its name was derived from the National Shrine of Our Lady of Fatima or Pambansang Dambana ng Birhen ng Fatima (in the Tagalog language) near the Valenzuela campus. It is not affiliated with the Catholic Church and welcomes students of all faiths (as do Catholic universities). The Sanctuary of Fátima (Portuguese: Santuário de Fátima), also known as Sanctuary of Our Lady of Fátima (Portuguese: Santuário de Nossa Senhora de Fátima), is a group of Catholic religious buildings and structures in Cova da Iria, in the civil parish of Fátima, in the municipality of Ourém, in Portugal. In addition to the Basilica of Our Lady of the Rosary (Portuguese: Basílica de Nossa Senhora do Rosário), the shrine comprises the Chapel of the Lausperene (Portuguese: Capela do Lausperene), a great oak tree (near which the Marian Apparitions occurred), a monument to the Sacred Heart of Jesus (Portuguese: Monumento ao Sagrado Coração de Jesus) and the Chapel of the Apparitions (Portuguese: Capelinha das Aparições), where three children Lúcia Santos and her cousins, Jacinta and Francisco Marto, were first visited by Virgin Mary. In addition, several other structures and monuments were built in the intervening years to commemorate the events associated with the events in 1916, including: the Hostel/Retreat House of Our Lady of Sorrows (Portuguese: Albergue e Casa de Retiros de Nossa Senhora das Dores), the rectory, the Hostel/Retreat House of Our Lady of Mount Carmel (Portuguese: Casa de Retiros de Nossa Senhora do Carmo), a segment of the Berlin Wall (marking the consecration of Russia to the Sacred Heart of Christ), monuments to Fathers Formigão and Fischer, a High Cross (by artist Robert Schad), and individual monuments to Pope Paul VI, Pope Pius XII, Pope John Paul II and Dom José Alves Correia da Silva (who had important roles in the history of site) and the Pastoral Centre of Paul VI (Portuguese: Centro Pastoral de Paulo VI). Across from the main sanctuary is the much larger Basilica of the Holy Trinity constructed after 1953, owing to the limited scale of the Sanctuary for large-scale pilgrimages and religious services. Sol de Fátima is a Spanish-language Catholic devotional magazine published by the Blue Army of Our Lady and is devoted to the message of Our Lady of Fátima. The Miracle of Our Lady of Fatima is a Warner Color feature film made in 1952. It was promoted as a fact-based treatment of the events surrounding the apparitions of Our Lady of Fátima, in Portugal, in 1917. It stars Susan Whitney as Lúcia dos Santos, Sherry Jackson as Jacinta Marto and Sammy Ogg as Francisco Marto, with Gilbert Roland as a fictional character named Hugo, a kindly but agnostic friend of the three children, who rediscovered his faith in God through the miracle of the Sun. The musical score by Max Steiner received an Academy Award nomination. The film was released on DVD on April 4, 2006.